View Baglio Maragani - Country House in a larger map. From Agrigento: Take the SS 115. When you get to follow the signs to Sciacca in Foggia. Foggia and then go straight follow directions to Cape San Marco and turn left. Follow the road for about 7 km on your left until you meet Via Selinunte. Turn left and follow it until you come to on the left of the entrance road to the Country House. From Palermo: Take the Palermo-Sciacca, to 78.900 Km turn right towards Menfi 10. Continue straight for about 5 km. and you will encounter a crossroads. Turn right and immediately left and follow signs Capo San Marco. After about 5 km. on the right you will find the Via Selinunte. take and follow it until you come to on the left of the entrance road to the Country House. 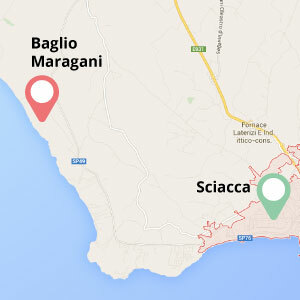 From Trapani - Birgi Airport: Take the A 29 direction Palermo-Mazara del Vallo and follow the signs to Mazara del Vallo. Exit Castelvetrano Take the SS115 and continue to Sciacca. When you get to follow the signs to Sciacca in Foggia. Proceed straight past the Foggia and follow signs for Cape San Marco so turn right. Follow the road for about 7 km on your left until you meet Via Selinunte. take and follow it until you come to on the left of the entrance road to the Country House. From Falcone-Borsellino Airport: Merge onto A29 dir. Mazara del Vallo. At Km 62 outputs Gallitelli and follow the signs to the Palermo-Sciacca. After 15 km. you are on the Palermo-Sciacca. 78.900 Km Walk and turn right towards Menfi 10. Continue straight for about 5 km. and you will encounter a crossroads. Turn right and immediately left and follow signs Capo San Marco. After about 5 km. on the right you will find the Via Selinunte. take and follow it until you come to on the left of the entrance road to the Country House.